Rather than risk accosting the slavers in the lair—not that we had any idea where their lair was—we decided to lay in wait at a likely spot, and ambush them as we passed. After some searching, we found one–a narrow area with an overhang some 10-20′ above. We set up a hide, and observation point, and Darion even conjured us up a Rope Trick so those not on look-out could be held from view. Aunt Petunia would approve. There was nothing she liked more than a good ambush. And she certainly hated slavers–for good reason. We were there almost a week before anyone of any description traversed the passage, but when someone did appear it looked very much like what we expected: a group of grey-skinned derro, led by a strange grey creature with a squid-like head. Well, to be honest, that was a bit of a surprise. With the aid of an invisibility potion, I cautiously made my way forward unseen in the darkness, well above the enemy and screened from them by the rocks and ledge. Apparently not quietly enough. 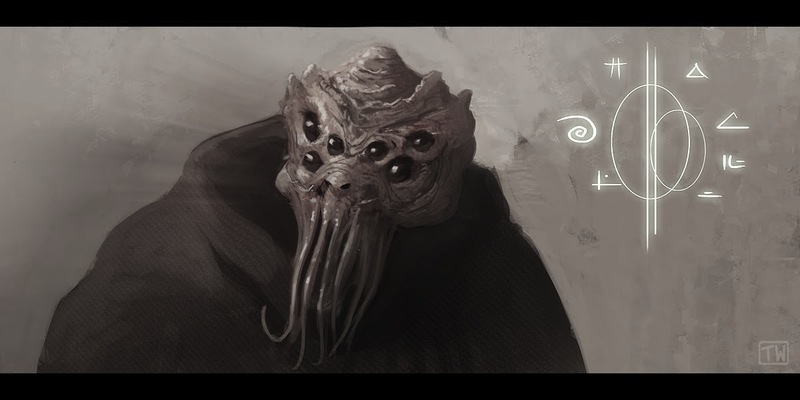 The creature–Darion would later call it an illithid, or mindflayer–looked in my general direction, and I slumped to the ground unconscious. When I finally awoke some minutes later, the slavers were all dead–save one, ensnared in Darion’s web. We knocked him out, took a sample of his hair, looted the bodies, and left him with the others as if left for dead. We then retired a day’s travel away so that Antonio might scry our quarry. For the next two days our cleric got some fragmentary images of what appeared to be the derro lair. Then the images stopped, likely because our foes had grown suspicious. That was dangerous—if they knew our interest in them, they might show greater interest us. Iuz got a bad feeling about this….